www.powerchutes.com Antenna by Richard Stuart. 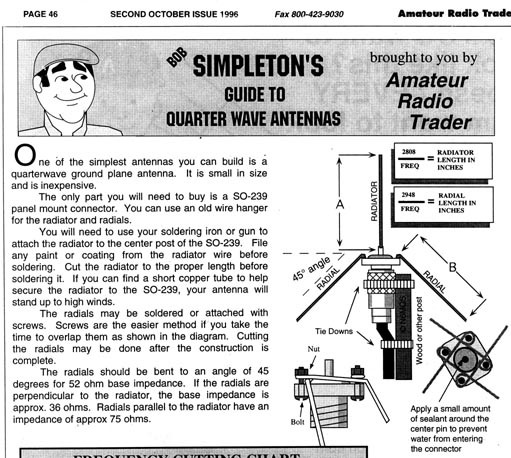 to using the tried and true groundplane antenna. For the nuts and bolts, use stainless steel 4-40 hardwareit can be found at a hardware store. use two 4 sections of PVC with a female-to-female connector in between. Use cable, or zip ties, for the tie-downs. hangers at all, but 3/32 brass rod stock: it wont rust as the steel will in the hangers. resonant frequency, itll be most efficient at that frequency. of the connector for bolt-down purposes. For whimsy, put a Jack in the Box antenna ball on top. ? So, for around $25, youll have a portable antenna that works tons better than the rubber duck. As always, if you have any questions, send me an e-mail.